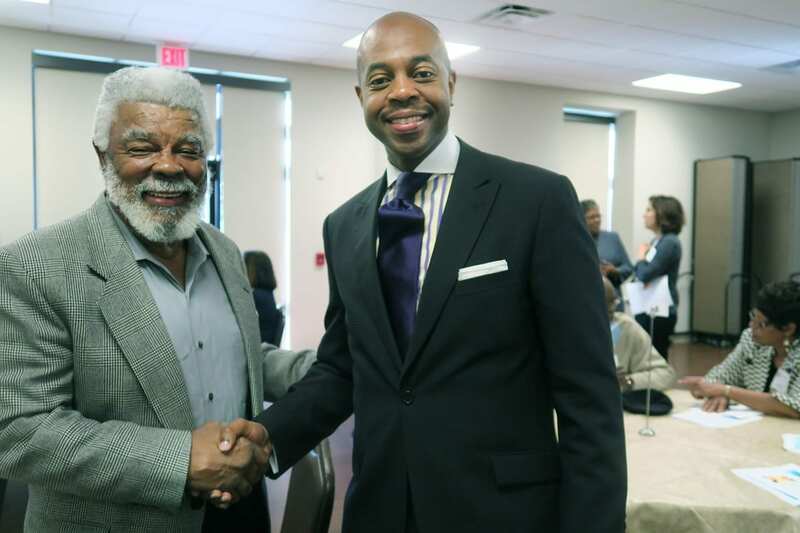 NASHVILLE, TN — Membership in a faith community can protect the health of congregation members, community activists and church leaders learned on Saturday. Health service providers and church leaders at the Faith and Health Summit met at Lee Chapel to discuss “The Role of Congregations in Health.” Representative Reverend Harold M. Love, Jr. of the Tennessee General Assembly and pastor of Lee Chapel AME Church hosted the event. Not having a religious faith has effects on health. “The lack of religiosity is equivalent to 40 years of smoking a pack of cigarettes a day,” according to Dr. Kimberlee Wyche Etheridge, MD and Assistant Director for Public Health Practice and Assistant Clinical Director in Pediatrics for Meharry Medical College. The African American community has a higher risk of mortality among several diseases than the ‘average’ of the general population. Heart disease, chronic lower respiratory disease, diabetes and stroke have higher incidence per 1,000 people among the African American community than the ‘average’ Davidson County population, according to research presented by Dr. Etheridge. However, resiliency offers some protection — a positive outlook on life, ability to handle stress and a religious faith. External factors such as being a member of a supportive community and strong faith centers in the community also boost resiliency, according to Dr. Etheridge. Kristy Sinkfield, Director of Strategy and Innovation Office for the Vanderbilt Medical Center who is also the “First Lady” of Payne Chapel AME Church, where her husband is a pastor, described how their church’s “Biggest Loser” type program offered a gift card to winner of a weight reduction program. Group members supported each other and wanted to avoid fines for gaining weight. “If you lost weight you didn’t pay anything. If your weight stayed the same you paid $1. If you gained you had to pay $2. I heard a lot of the women saying they did not want to pay that $2 fee and laughing with each other,” Mrs. Sinkfield said. The program at her church is an example of the social networks that offers support to members, which, along with improving health through weight loss, helped boost the resiliency of members. A Congregational Health and Education Network (C.H.E.N.) has been developed in Nashville, according to Dr. Kimberly Lamar from Nashville General Hospital. (A similar program exists in Memphis.) The goal of the network is not simply to reduce numbers of African Americans suffering from illness, but to achieve health equity. That means ensuring equal number of health resources are being offered to the African American community. “Completing a high school diploma results in lower rates of disease. Completing a college education results in a five times higher probability of survival,” said Dr. Lamar. As a part of health promotion at churches, pastors at churches such as the St. James Missionary Baptist Church are being trained to recognize the warning signs of self-destructive and suicidal behavior in a program described by Gwen Hamer of the Department of Mental Health & Substance Abuse Services. “Pastors have a lot of influence and by teaching them the symptoms, they can determine if a person is suicidal and have the resources to refer them.” Ms. Hamer said. Symposium attendees also met in groups to describe some of the best practices currently being offered by churches in their community. A support group for men encouraging them to go for prostate cancer screening and a support group for a “Forever Young” group of women to combat isolation was described by attendee Charles Smith.